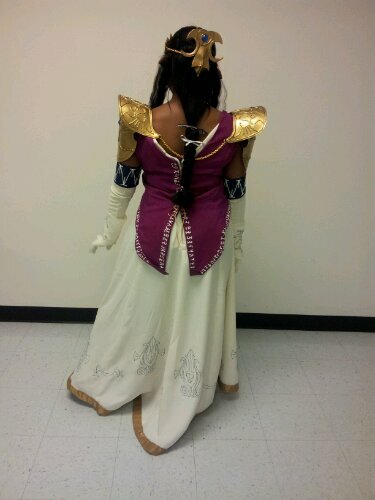 For spirit week, my company included a Video Game Character Day. This is not surprising, since I work for a hosting company, comprised mostly of game enthusiasts, myself included. My original list of work appropriate characters was made up of Zelda (version undetermined), Chun Li (not as inappropriate as most people think), American McGee’s Alice (not widely recognized, but simple), and Princess Peach (so much pink). 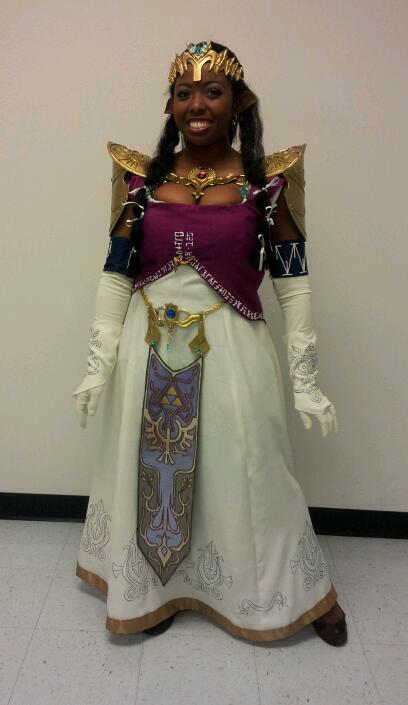 Since I wanted to try out cosplay armor, the Twilight Princess iteration of Zelda was perfect. I had 13 days to make it work. The clothing was simple enough, and I was able to use fabric, notions, and patterns that I had on hand. I pulled Butterick 4827 for the gown, with modifications. I omitted the sleeves, replaced the back lacing with a zipper, dropped and V-ed the back, and squared the front neckline. I used what I think is a woven polyester in off-white. It had some slink to it, and I was fairly certain that it could take whatever abuse would be necessary for the hemline decorations. I used blanket binding for the hem, which turned out extremely well because the dress had a slight train and needed to stand out a bit to show the motif. 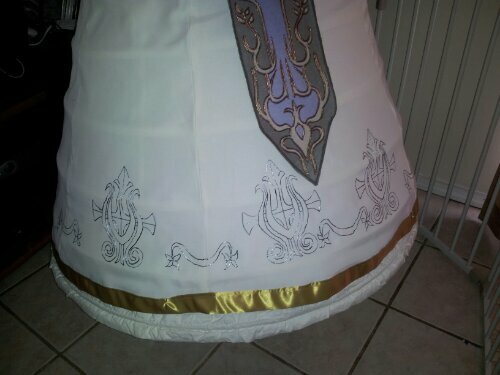 Deviating from the character design, I didn’t do pleats, and I left out the second row of trim along the bottom. The vest started out as Simplicity 2172, which needed major modifications in the cut. If I had more time, I would have just drafted my own pattern, but I didn’t, so there you go. I also changed the opening from front to back, changed it from under to over bust, V-ed the back, and omitted the sleeves. In the mock-up/lining, I was able to get rid of more of the purple foiled linen that made up my comfort gown, and I used a soft, light polyester for the fashion fabric. Due to time constraints, I had to make an executive decision to use puffy fabric paint rather than embroidery. I’ve barely scratched the surface of embroidery digitization, and I have a small hoop, so all of those harps would have been a nightmare to piece. I would have also needed to create a custom font for the Hylian script on the vest, which was, again, not something I had time or patience to complete. I used chalk to outline the vest’s writing, and I used a blue pencil to trace the harp motifs from Zeldaness (Deviant Art). Using a light flow, the paint worked extremely well, and I used an online translation of Hylian to make my own label of sorts. The vest said something like, “Interpreted and constructed by Shasta of greenlinenshirt.com.” It was fun. Since the dress is slinky, I draped it over my farthingale for painting and gave it a full day to dry before trying it on again. I used the same painting method for the gloves, using vintage opera length gloves as a base (also used for the Clockwork Droid), attaching the decorated fabric scraps with tacking stitches. When I wear this character again, I’ll make a pair of gloves specifically for this. 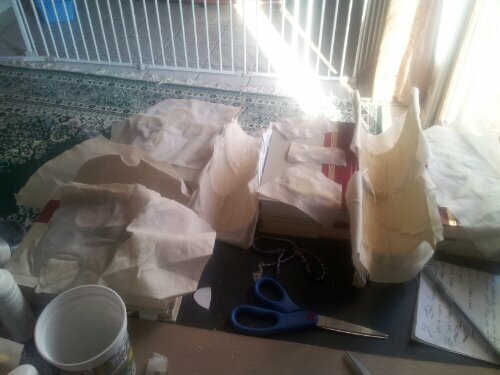 For the armor, I used a combination of a few craft foam tutorials, taking serious shortcuts, since I really only had a weekend to get the bulk of the construction done. 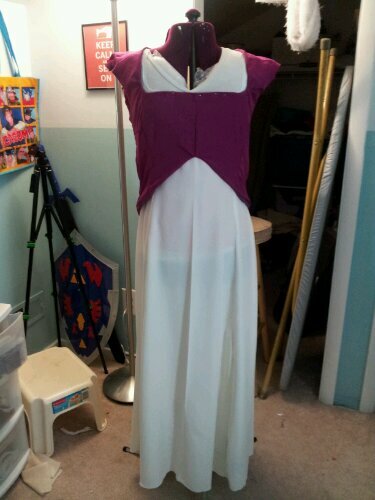 I used tutorials from cosplayers Penwiper, Firefly Path, and Amethyst. 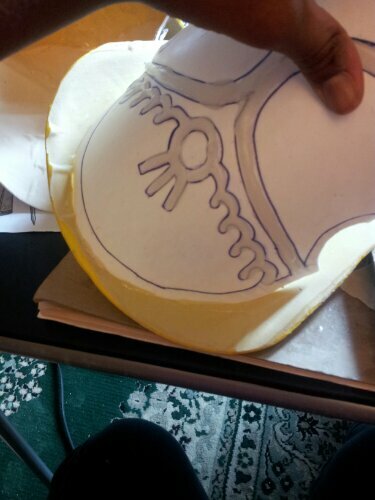 Using templates from Zeldaness, I cut yellow craft foam and traced the surface designs in pen. Heat molding the armor was about as easy as I expected, but I was concerned that the pieces wouldn’t retain their shape, so I kept them wrapped around various household items during the gluing process. 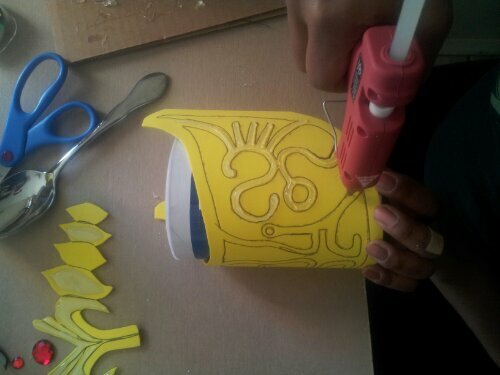 Both small and large glue guns were used for the raised details. My sealant was only glue and water, mixed to what I thought was a good consistency, and I did about seven coats, making sure to let each dry reasonably well. I kept the mixture in a bowl lined with aluminum foil so that it wouldn’t dry out between coats. Unbleached muslin was enough for the interior, and I only used one coat of the glue/water solution which was enough to take the paint at that step. I left out the Rub ‘N Buff and the floor polish only because I was too lazy to look for them in the store. In addition, I didn’t grab metallic gold acrylic paint, so I used goldenrod for the base. The metallic spray paint on top didn’t look bad, and I used black acrylic paint in the crevices (rubbed off with a cloth) to age all of the pieces. I think I did two coats of spray paint, one coat of aging, then one more coat of spray paint. The crown didn’t like being bent, and it cracked just a bit on either side of the center piece, so I filled it in with the goldenrod to make it less noticeable. After everything was dry, I used an awl to poke holes for the gold chain links. Again, because of time, I bought a couple bags of flat-backed acrylic gems in multiple sizes and couple bags of mixed plastic gems of various shapes, rather than ordering the exact shapes and sizes online. 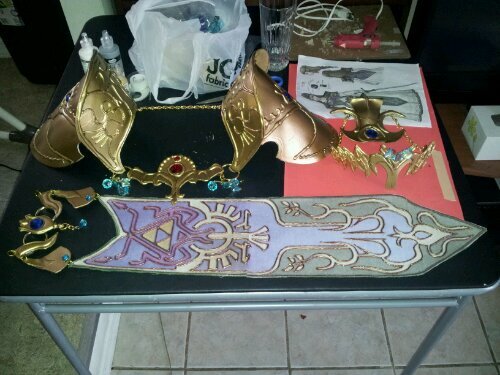 The individual links, a length of gold chain, and a few jewelry findings gave me an approximation of the armor’s details. 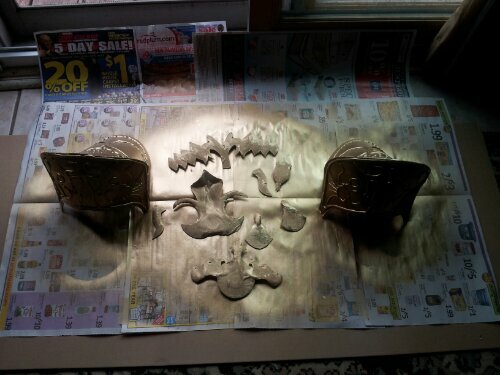 The belt banner was a special challenge because I knew that I didn’t want to free-hand the design from the reference pictures and have to paint it. I decided to enlarge one of the reference pictures and print it on fabric t-shirt transfer paper. It was printed in three sections, which I ironed onto stiff cotton. I outlined the entire design in brown puffy paint and zig-zagged the edges to prevent fraying. 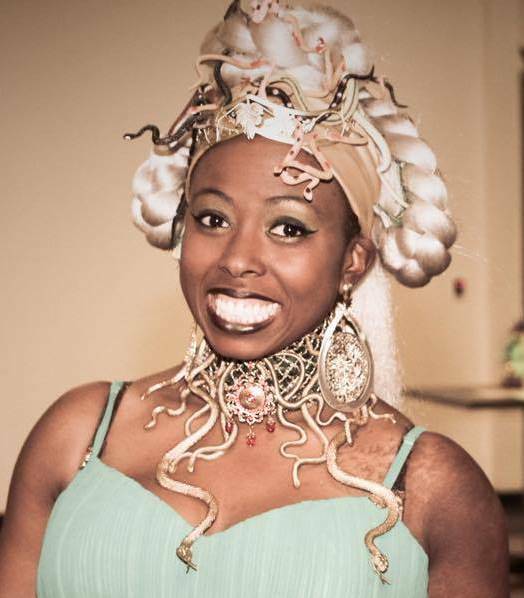 The night before the debut, I dug loose hair out of my wig bin and separated it into three sections. I pulled my own hair into a half-up/half-down do and secured the back to the thickest piece with a barrette. I secured the front pieces in with bobby pins and tied them with silver ribbon. It wasn’t my first choice, but I didn’t have time to do the wrapping with cotton strips. I purchased a pair of “evil ears” and colored them with Ben Nye Cinnamon foundation and loose powder. I used spirit gum rather than the in-the-box adhesive because I’m familiar with it. 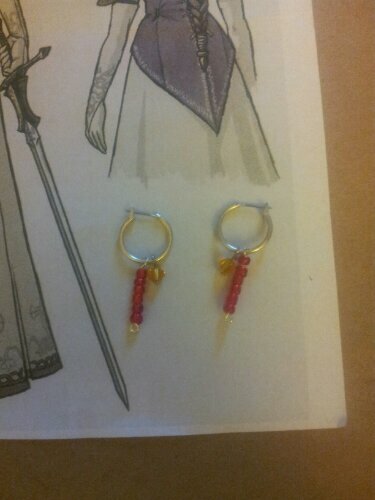 For the earrings, I added red beads and a yellow Swarovski crystal to each silver hoop. I wore brown ballet flats to complete the look. With minimal face makeup, I did choose a purple palette for my eyes. The costume was a great success and was on par with the level of costuming that I’ve done for work in the past. If I had it to do again, I would give myself a full month, draft my own pattern for the dress, make the gloves from scratch, and spend more time on armor construction. It’s pretty sturdy now, but I think I can do better. I would also style a wig for the hair—not because I didn’t like the way my hair turned out, but because I wouldn’t have found bobby pins in my hair the next day. I really, really, really want a reason to try more craft foam armor, because there are so many possibilities, and this project truly tested my craftiness.